The stereotypical desert has sand dunes, cacti, blazing sun, rattlesnakes and scorpions. In fact, deserts are far more varied. They do have some things in common: They are dry, have limited vegetation and comparatively few species of animals. Only some deserts have sand and excessive heat; others are rocky and cold. Because of this, populations of predators and prey in deserts are not universal. The one thing they do have in common is the ability to survive in arid surroundings. Black-tailed jackrabbits live in American desert scrub lands. These nocturnal hares are indiscriminate herbivores, eating any plant life they can reach. Jackrabbits extract any water they need from the vegetation they consume. To be successful, predators, such as hawks, coyotes and bobcats, must catch this speedy prey, which combines running and hiding to avoid capture. A jackrabbit warns others of danger by flicking its tail to expose the bright white side. Females can have up to four litters during the year, with an average of three or four kits per birth. The kangaroo rat is an American desert dweller that lives in a burrow during the day. At night it emerges to feed, primarily on seeds, grass and other plants, although insects are occasionally on its menu. This food provides enough water for the rodents, allowing them to survive in the desert. 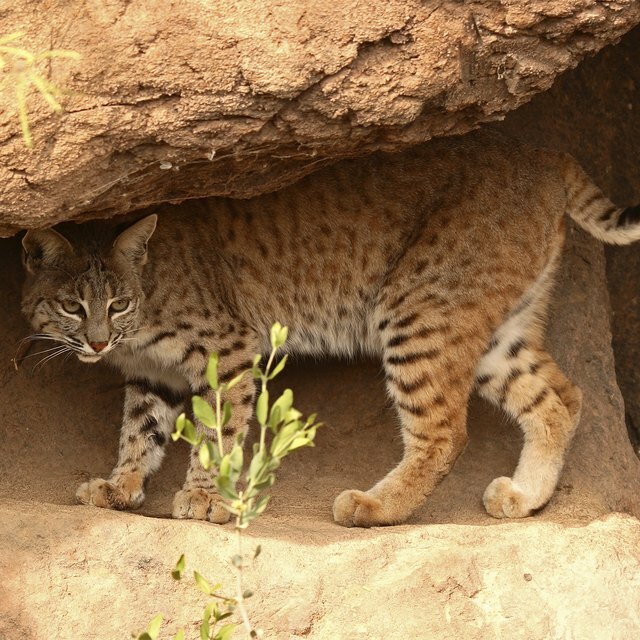 Predators, though, are a threat -- snakes, foxes, badgers, owls, bobcats and coyotes. If they can manage to evade predators, kangaroo rats have a life span of two to five years. Mountain lions live in a variety of habitats, such as deserts, swamps and forests. They have a limited need for fresh water. Although they are predators, they spend much of the day hiding and resting behind rocks, bushes or any available shelter. Their powerful back legs give them tremendous running and jumping abilities, making them fierce predators. Mountain lions are able to take down prey larger than themselves, killing with their sharp claws and strong jaws. They are wary of humans, however, and seldom appear where people can observe them. Many owls are found in American deserts, and the elf owl is one of the smallest species. The combination of excellent vision, even in low light, superior hearing and silent flight allows them to successfully catch prey at night. Invertebrates such as scorpions, centipedes and beetles are the owls' primary source of food. Elf owls can themselves be prey of larger owls, snakes, coyotes and bobcats. But because their nests are built high off the ground, often in enormous cacti, predators have limited success. The cacti also serve as a water source for the owls. 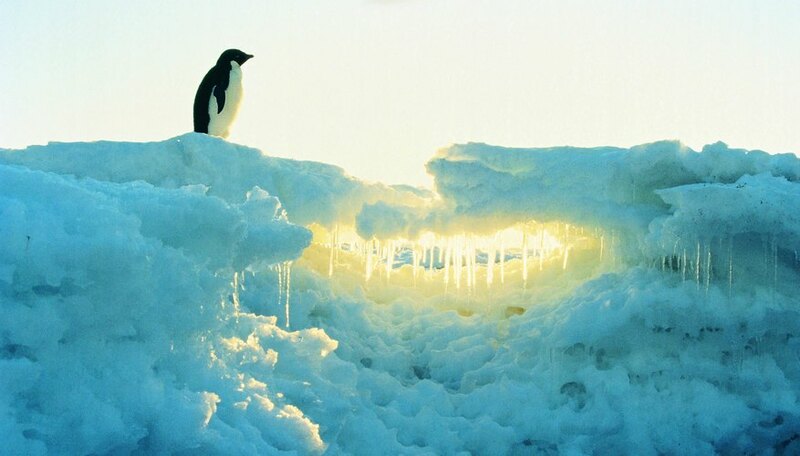 Emperor penguins, the largest penguin species, are native to a cold desert: Antarctica. While on the surface, the adults have no natural predators. The penguins spend a great deal of time on the ice as they usher in the next generation. Each year emperor penguins journey 50 miles inland to breeding grounds. After the female lays an egg, she returns to the ocean for food and water. The male stands guard until the female returns to care for the chick; at this point the male heads off in search of sustenance. After six months of this continual trek between the breeding colony and the ocean, the entire family heads to the water. There they face predators such as leopard seals and killer whales. U.S. Geological Survey: What Is a Desert? Sherwood, Susan. "Five Populations That Could Be Found in a Desert Ecosystem." Sciencing, https://sciencing.com/five-populations-could-found-desert-ecosystem-22018.html. 25 April 2017.